Our original facilities took up only 4,000 square feet, with an additional 400 square feet for offices. The factory included a cutting saw and polisher. One year later, thanks to a well-filled order book, the factory’s workspace expanded by 50% to 6,000 square feet and was equipped with a profiler to be able to shape edges and create molding. The company grew from 3 employees at the time to 6 in 1993. In 1995, the company acquired a former chop saw that was completely rebuilt and modernized as a standalone stonecutting device. The equipment’s success allowed the company to expand further, from 6 to 15 employees. In 1999, with the arrival of a new chop saw that went up to 24″ thickness, the factory was required to grow to 8,000 square feet and take on an additional 10 employees for a total staff of 25. 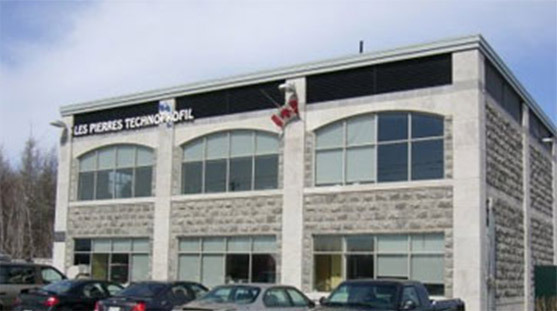 In 2000, driven by high ambitions and growing demand, Technoprofil became the owner of a new, custom-built 13,200 square foot building (10,800 devoted to the factory and 2,400 devoted to offices). The company also acquired a programmable saw with a 12 foot diameter blade—the first of its kind in Quebec at the time. In 2001, to take the workspace to the next level, an additional 3,600 square feet were added to house the finishing and packing facilities. In 2002, the company counted 32 employees. Following a very substantial order of premium products, Technoprofil acquired a two-axis cutting saw and three-axis cutting saw, both CNC-controlled, to eliminate waste and drastically cut down on production times. In 2003, with the expansion of the company’s service area, a tractor trailer and three-wheel-drive forklift were purchased, along with another chop saw similar to the first one. 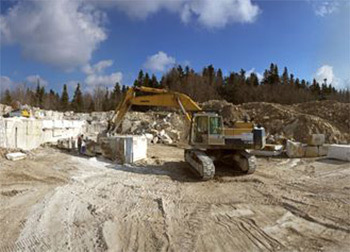 In 2005, Les Pierres Technoprofil acquired a CNC-controlled bipolar five-axis machine, becoming the first company with such heavy-duty machinery in North America. Its staff count now stood at 40. In 2007, to be able to recover non-usable pieces of stone, the company owners acquired a 300-ton stone cutting guillotine. In 2008, the factory made a further upgrade by purchasing two new saws, resulting in even greater accuracy and faster production times.